The past two weeks have brought time to reflect and catch up on some reading. As I’ve done so, I was moved by the statement above. Yong Zhao is the Presidential Chair and Director of the Institute for Global and Online Education in the College of Education at the University of Oregon. I heard Dr. Zhao speak at a Learning and the Brain Conference a few years ago and have been captivated by his thinking ever since. He is not only entertaining; he also understands the challenges our students will face in a rapidly changing world. “Reading and writing should be the floor, not the ceiling.” Reading and writing are the basis of an educated populace; our goal is that all of our citizens are able to read and write. That is not the end game. If it were, how would we compete in a world market? How would we inspire our students to create and innovate? It is not enough to read and write and, I might add, to compute numbers. We need these skills to be able to do so much more. As we begin 2016 and I consider the goals of students at Wilmington Montessori School and at every school, what I know is that the children are at the center of what we do and why we are here. Children are eager to learn, to ask questions, and to play with materials and ideas. They are naturally curious and willing to try and try again. They are thrilled when they unlock the squiggly lines that make up the words they learn to read and write. They can’t get enough. Our responsibility is to keep that wonder alive. We must create a strong and sturdy foundation of those skills in order for them to apply them to increasingly challenging and interesting work. We cannot simply pat ourselves on the back when we can prove through test scores or other measures that our children can read and write. We must challenge ourselves to do more. The “more” is creating an atmosphere where learning is valued and everyone is a learner. That is what we strive for each day and each new year at WMS. Learning is at our core, and learning is not defined by a grade, an age or an ability. It is defined by the very children in our midst. What is it that each child needs to remain engaged and inspired and wanting more? That is the question we ask ourselves each day as we greet the children at WMS. Last month, Nancie Atwell of the Center for Teaching and Learning won the first Global Teaching Prize. Atwell is a teacher in the small town of Edgecomb, Maine, and is known to so many other teachers throughout the world for her work in literacy, teaching the skills of reading and writing. At WMS, we have used her work as a guiding force in establishing the curriculum for the 9-12 Program. 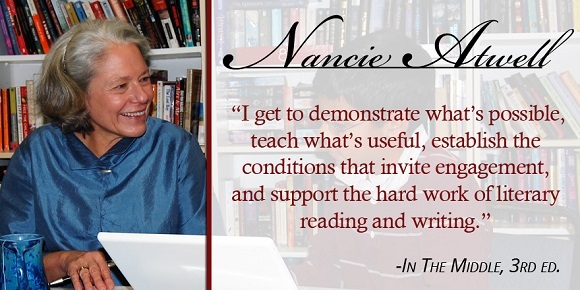 Although Nancie Atwell’s books are used by many teachers, it is who she is as a person that inspires teachers to refine their practice and do their best for the children they teach. Searching the website for the Center for Teaching and Learning leads one to understand the mission and values of the school, which align with WMS and its mission. Children are accepted for who they are, taught what they need to learn as individuals and given multiple opportunities to understand the concepts being taught. They are approached as individuals first. I have followed Nancie Atwell for years, attended her workshops and worked to incorporate her ideas and lessons into the lessons I taught. She is genuine – a person who listens and learns, inspires, and delights in the children in her classroom and school. It is fitting that she has received this prize and recognition for all that she has done for teachers everywhere. Note: If you click on no other link, check this link that suggests books for your children to read. It is a great resource.